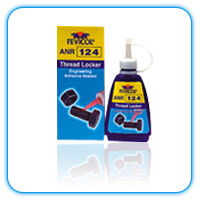 Thread Lockers are designed for sealing and locking of nuts, bolts and small screws. Superior to conventional locking devices. A solid understanding of industrial trends makes us one of the leading Traders and Suppliers of extremely useful array of Industrial Needles Bearings. Our product line consists of Cage Guided Needle Bearings, Drawn Cup Needle Bearing, Needle Thrust Bearings, Industrial Needle Roller Bearing and full Complement Needle Bearings. We have formed with business links with some of the renowned manufacturers of the industry to get access to the finest quality products. These products are widely demanded in the various industries as these are at par with international quality standards. We have constructed well-equipped warehousing unit that enables us store products in large numbers without causing any harm to their quality. Assisted by a skilled team of professionals, we take into account the ruling trends in the market and select needle bearings that can competently serve the modern demands of the industry. Our vendors have fabricated these products from high grade raw material as per global quality standards.